If you’ve been following Simple Organized Lifestyle for any length of time (thank you) you know there’s rarely any recipes added here because my cooking skills leave much room for improvement! This is one I’ve made the past three years in a row that’s perfect for holiday parties and gifts. 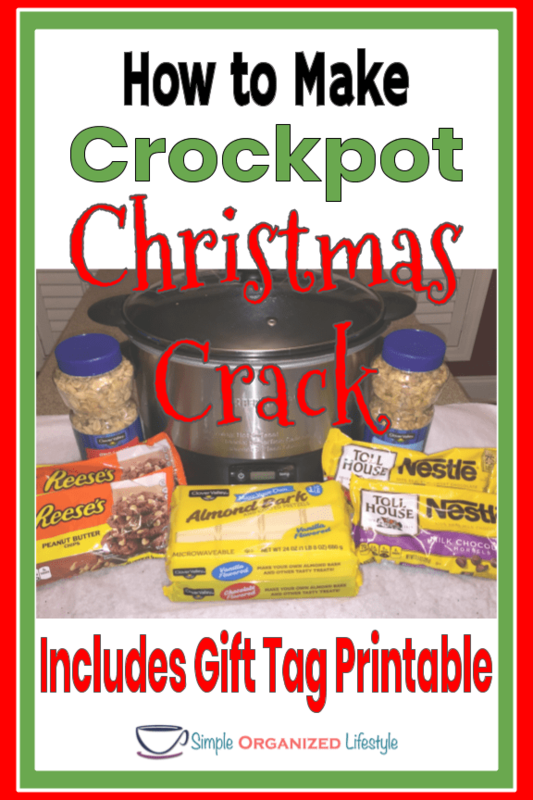 Crockpot Christmas Crack makes a lot to go around! It’s tastes like a cross between snickers and reese’s peanut butter cups. Crunchy, but chewy, salty, but sweet… all delicious! I take it to work along with hot wassail to share a holiday treat with friends. 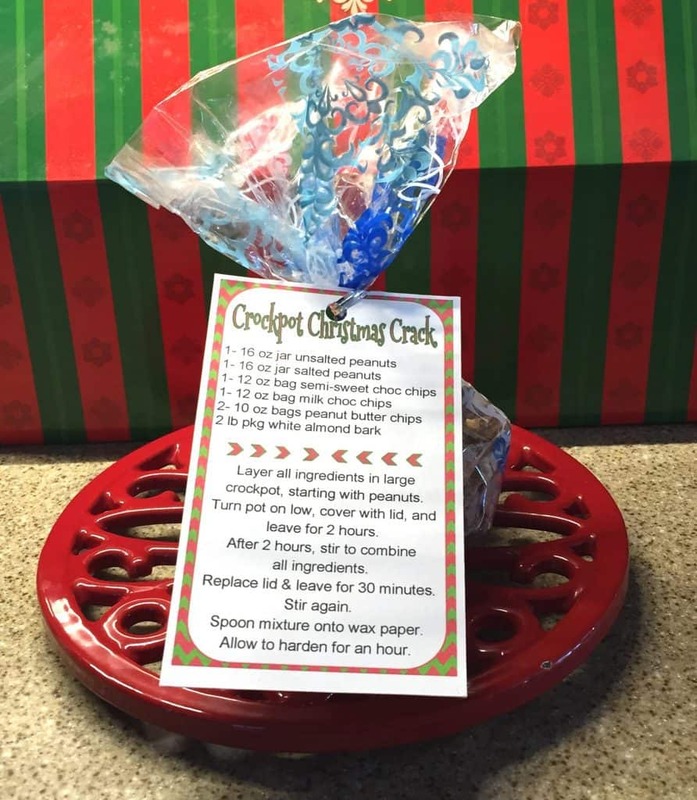 I love anything in the crockpot and making Christmas candy in it is even sweeter! These make thoughtful and tasty homemade gifts for co-workers, teachers, friends, and family. (As long as there are no peanut allergies of course.) They have always been a huge hit at home and work! 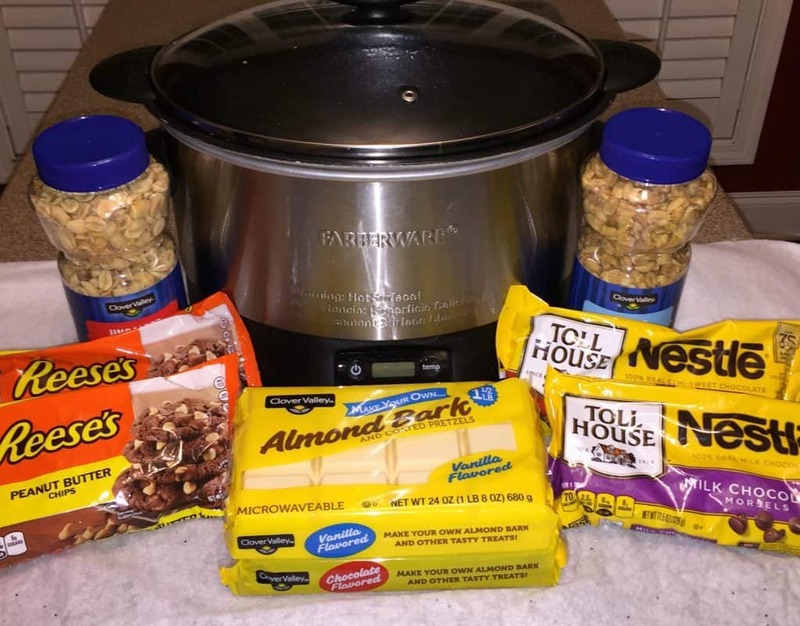 Layer all ingredients in a large crockpot, starting with peanuts. After 2 hours, stir to combine all ingredients. Replace lid & leave for 30 minutes. Spoon mixture onto wax paper. Allow to harden for an hour. I’ve done this two ways. Dropped it by spoonfuls onto the wax paper and have spread it out on the wax paper and broken it apart. Clearly one way is neater, but if I’m just putting it in one container for a holiday party, cracking it apart works just as well. It makes a lot… easily 75 pieces or more! I’ve had some at home that has still tasted fresh up to ten days after making it so you have a little time if you want to make these ahead. Hope you enjoy this holiday treat as much as we do! 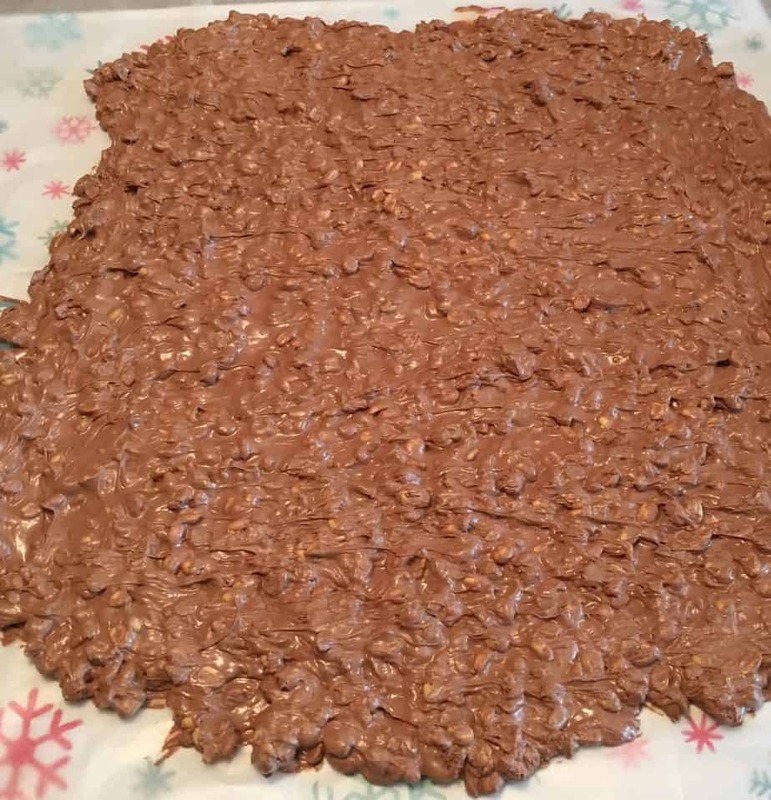 Can I add pecans, pretzels, or other fill-ins to Christmas Crack? This recipe does work well with additional fill-ins and/or substitutions. I would make it once as it is and then experiment, but that’s mostly because I’m not the most confident cook! Pecans and pretzels are the most common substitutions but I’ve also seen coconut and toffee chips referenced. Coconut and toffee chips would be better to add after the chocolate has melted. 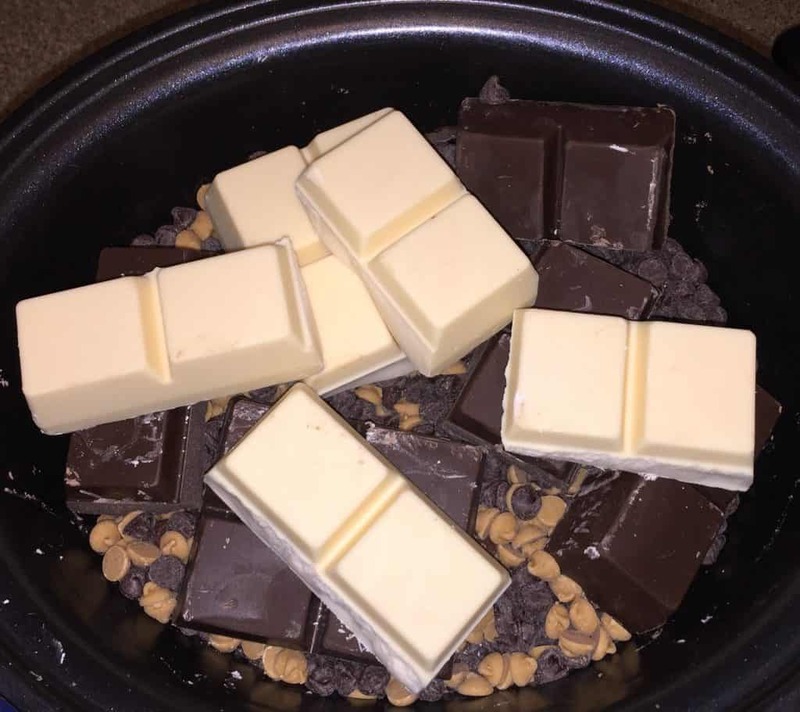 How many pieces of candy does this recipe make? It depends on the size of the clusters you make, but I’ve had it to make as many as 100 pieces. I would guesstimate that 75 pieces is the average. How long will Christmas crack last? In an air tight container, these should last anywhere from 2-4 weeks. Should I use a crockpot liner ? I would skip the liner with this one not to lose any chocolate that may stick to it, and just wipe it out with a wet paper towel while the inside is still a little warm. A light layer of cooking spray on the inside would be fine too. 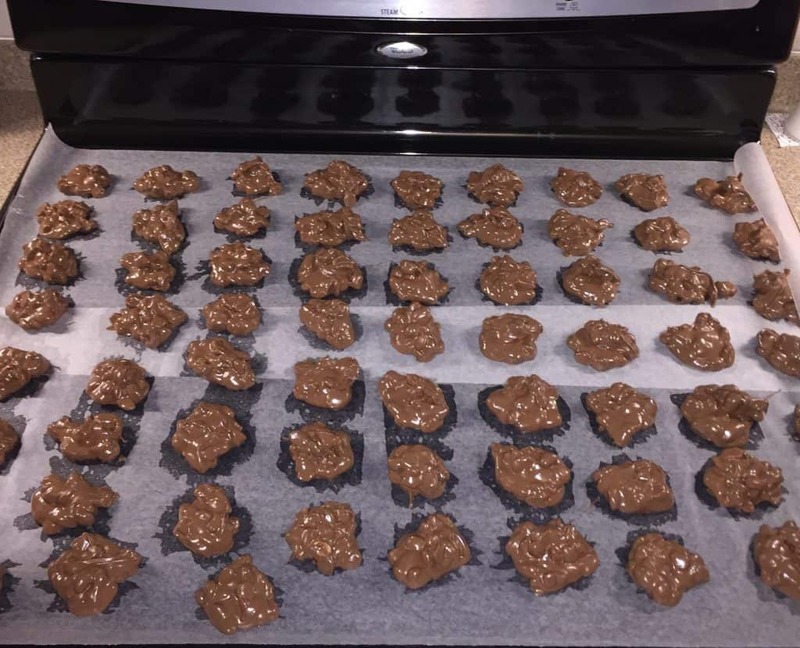 Do the peanut clusters burn easily? I have never had an issue with burning, following the exact recipe. However, all crockpots are different and yours might take less time. The only way to be sure is to check and stir more frequently. Any other ideas to use these as gifts? These would be great in Christmas tins, cellophane or holiday baking bags. They would also be decorative in mini muffin holders. Would dark chocolate work instead of milk chocolate? Dark chocolate would work for this recipe, they may not be quite as sweet but that may be a personal preference.